Why Invest in a Massage Chair? Find the Same Model for a Lower Price? As a leader in the massage chair industry, MassageChairDeals.com strives to provide a high level of customer service and give our customers the best deals possible on our massage chairs. If you find our products for a lower price at an authorized seller online or in-store, please get in touch with us and we'll beat the price. MassageChairDeals.com make the final determination as to whether a Price Matching request is granted. We reserve the right to discontinue this program at any time. Experience a new level of wellness with the Infinity Meridian. Stacked with the latest in massage chair technology, the Meridian is designed with a 49″ L-Track roller mechanism. This quad roller system massages from the nape of the neck all the way down to the back of thighs inside the seat of the chair, methodically moving from side to side as it travels the length of the 49″ track. The stylish Meridian offers unique functionality found in few massage chairs, including the ability to create personalized massage programs and store them into the chair, an Air Ionizer which facilitates healthy oxygen intake, an advanced foot roller mechanism with a heel rubber that targets the arch and heel of the feet, Bluetooth technology to relax to your favorite tunes, a secondary built-in remote control on the armrest to easily and quickly control several of the chair’s basic functions, and a USB station to charge your favorite device. The Meridian boasts six pre-set programs in addition to the two memory saving slots, 36 airbags which provide a compression-style massage, lumbar heat therapy to loosen tense and sore muscles, the popular NASA-inspired Zero Gravity recline, space saving technology to place the chair near a wall, body scanning technology to ensure all the right areas of the body are being massaged, a host of fine-tuning measures, and much more. The Infinity Meridian’s aesthetically pleasing design combined with its feature-packed attributes and competitive price point makes it an attractive choice for almost anyone. All of our massage chairs qualify for free curbside delivery, which typically ships within 1-3 business days of placing your order. Once the chair arrives at your local delivery terminal, the delivery company will give you a call to arrange a delivery window. Please note that the delivery person is not responsible for carrying the chair into your home, though they may if you ask them to do so. Also note that depending on the chair you are purchasing, it will arrive unassembled. Assembly instructions are included in your chair’s packaging and can be installed in about 15-60 minutes. If you prefer to have your massage chair assembled for you, a White Glove Delivery upgrade is offered for this massage chair. If this option is selected, a professional installation team will schedule an appointment with you to determine the best time to deliver your massage chair. Once the delivery team arrives, they will carry the chair into your home or business, remove the packaging, and install it in the room of your choice. Your chair will be operating correctly before they leave. Heat Therapy: Two heating modules in the lower lumbar of the Meridian is designed to warm up the back. Heat therapy loosens tight muscles and allows the rollers to dig into the back more effectively. All Day. Every Day. 24/7. The Meridian features Infinity’s signature 49 inch roller track in its backrest. The quad-style roller heads begin at the base of the skull, works its way down the back as it methodically moves from side to side, and tucks on the underside of the seat to reach the buttocks and the top of the hamstring muscles. The Meridian’s 49″ track provides 40% more roller coverage compared to traditional S-Track massage chairs. 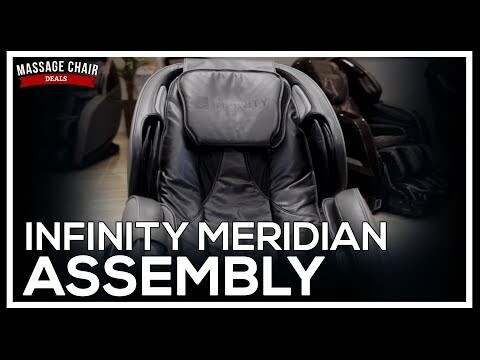 Infinity was one of the very first manufacturers to introduce a primitive version of the L-Track system to the massage chair market years ago and they’ve refined and perfected it for the Meridian. Revitalize your senses with the Meridian’s unique Air Ionizer feature. Not found in many other models, the Meridian has small vents located in the headrest of the chair next to the speaker system which gently blows purified air to promote healthy oxygen intake. The freshly circulated air during your massage session will leave you feeling focused and refreshed. The Meridian gives you the option to activate this feature by tapping the “Negative Oxygen Ionizer” button on the remote control. If active, it will display parts-per-million airborne particles captured during your massage session. The Meridian’s roller massagers will scan your spine and detect the location of your neck and shoulders prior to the start of any program. Based on the information the computer detects, it will calculate the ideal roller massage start point and makes micro adjustments, personalizing the massage for your unique body shape. Down in the footrest, the ottoman automatically extends and retracts prior to the massage, stopping only when the sensor detects it has hit the bottoms of your feet. The Meridian will comfortably accommodate users from 5’0 to 6’2 and up to 325 lbs. The Meridian includes the popular, ergonomically correct Zero Gravity recline position. During Zero Gravity, the backrest reclines back 175 degrees as the footrest elevates to heart level. During this position, your weight is fully supported by the backrest of the chair, resulting in a firmer massage. Zero Gravity aids in muscle relaxation, improves circulation, and rejuvenates the body. Place the chair in Zero Gravity for ultimate relaxation, or independently alter the angle of the backrest and footrest on the remote. Spinning mechanical rollers are located on the bottom of the footrest to apply a Shiatsu-style massage to the soles of the feet. As the rollers target the foot’s pressure points, airbags inflate and push the feet down into deeper contact with the rollers. The Meridian’s foot massage system also includes an innovative heel rubber which targets the heel and arch of the feet, bringing a new dimension to foot roller technology. The speed of the foot rollers can be adjusted up to three levels for optimal versatility, from fast to slow. The Meridian’s next generation airbags are strategically placed throughout the chair to bring a full body massage experience. The airbags work in concert with the extended roller system to grip the outer shoulders, arms, calves and feet. As the airbags inflate, it will introduce a stretch and twist motion that will breathe new life into your body. The Meridian offers three airbag zones. You can activate all the airbags at once, or just turn on the airbags in the arms or legs. The airbags have three intensity levels, from strong to weak, and the intensity can be adjusted independently throughout the chair. If you prefer a stronger arm air massage but a weaker leg air massage, for example, this can be achieved on the remote control. The Meridian is equipped with six automated full body and regional programs expertly designed by Infinity engineers. Simply tap one of the programs and begin your therapeutic massage within seconds. The auto programs include Recover, Soothe, Relax, Shoulder & Neck, Waist & Spine, and Demo. The Meridian’s L-Track design permits the chair to be placed within inches of the wall behind it. As the Meridian reclines back, the chair slides forward on its base simultaneously, allowing you to place it in compact places. 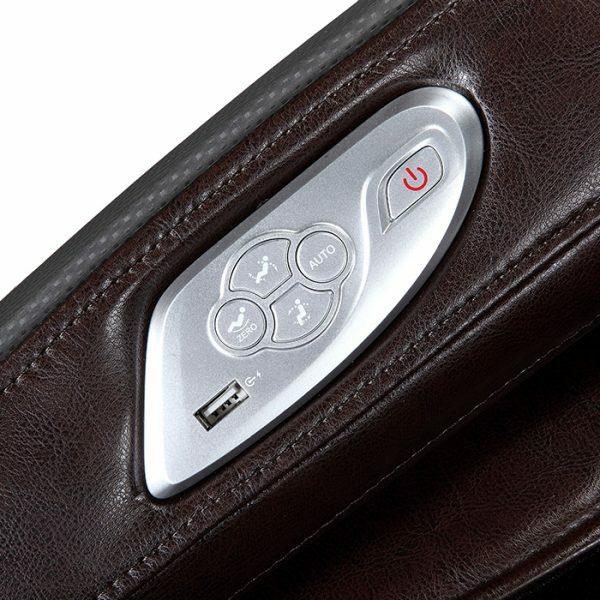 The headrest of the Meridian features a dual speaker system located at ear level. Simply pair your smartphone, MP3 player or other Bluetooth-compatible devices to the Meridian and sit back as you listen to your favorite music tunes, podcasts, eBooks and more as you enjoy your massage. Conveniently located on the right armrest of the Meridian are 5 quick keys. Power on/off the chair, recline into Zero Gravity, cycle between the auto programs, and adjust the backrest and footrest recline or incline easily without having to reach for the remote control. Low on charge? A USB charging station located to the left of the quick keys allows you to charge your smartphone or any other device while the Meridian is powered on. The Meridian removes the hassle of creating a manual massage and then forgetting what options you selected during your last sitting, or having to go through that process again. With the Meridian’s two unique memory functions built into the remote you have the option of storing the custom massage during your next session by tapping the “Memory 1/M1” or “Memory 2/M2” buttons after your massage is complete. The Meridian has LED lights that are located on the outside of each armrest. When using the chair in a dark room or with the lights dimmed, the lights will reflect off the nearest wall, boosting your mood and creating a therapeutic atmosphere. The Meridian comes with a clean, intuitive remote control to easily toggle through the chair’s auto programs, adjust the recline pitch, create a targeted massage, and more. The top of the remote has a LCD screen which displays which options are activated at all times. When you invest in the massage chair of your dreams, we know you’re investing in the comfort and longevity that it will provide. The Meridian provides unparalleled wear resistance and is highly protected against corrosion – we’ve even tested it in a potent dose of sodium hydroxide for 72 hours. The material of your chair is easy to clean, protected against extreme temperatures and features a very breathable material for simple care and maintenance. Suggested User Height 5’0 – 6’2 ft. Suggested Max. User Weight 325 lbs. Weight Product gross weight: 253.5 lbs. Infinity guarantees that your qualified product will be replaced or repaired at our option, without cost to you, should it be deemed defective because of faulty parts, workmanship or structural defects during the first five (5) years of ownership. This warranty plan includes one (1) year of in-home labor, three (3) years of parts, and five (5) years of structural framework. For an additional price, Infinity offers a three year parts, labor & framework bumper-to-bumper warranty. This includes a total of three (3) years of in-home labor, three (3) years of parts, and three (3) years of structural framework coverage. For an additional price, Infinity offers a five year parts, labor & framework bumper-to-bumper warranty. This includes a total of five (5) years of in-home labor, five (5) years of parts, and five (5) years of structural framework coverage. This extended warranty plan offers the most comprehensive coverage. NOTE: Your preferred warranty option can be selected prior to adding this massage chair to your cart. The free 5 year warranty option is selected by default. You have 30 days from the date of purchase to add an extended warranty. Warranties cannot be stacked. Call us at 844-862-4391 to add an extended warranty to an existing purchase. Have a question? Ready to make a purchase? Give us a call any time toll free at 844-862-4391. You may also talk to a Massage Chair Specialist directly on the bottom right side of this page via live chat. All our massage chairs are listed at the minimum advertised price (MAP). If you find the same model at the same price, contact us and we will price match our competitor and may also offer you an additional discount. All massage chair orders are shipped free via curbside delivery. White Glove Delivery -- where an installation team will take the massage chair into your home or business and assemble it for you -- is also available. Customers outside the state of Illinois are not subject to state sales taxes. Why Buy a Massage Chair? Be the first to know about our special massage chair promotions and sales, latest industry updates, and more by becoming a member of our newsletter! © Copyright MassageChairDeals.com. All Rights Reserved. © MassageChairDeals.com. All Rights Reserved.